Alcohol and boating go together like peaches and cream, like salt and pepper, like Mutt and Jeff, like Sonny and Cher. After all whoever heard of going fishing without a six pack of beer? It’s one of our national pastimes isn't it? Here it is, the big three-day weekend you have been waiting for, that long anticipated fishing trip to Lake Powell. You and the guys have been planning this trip for a couple of months now. You have had the boat and motor checked out at the local boat shop. You have gone over the trailer with a fine tooth comb. You’ve checked the tires, checked and tested the lights and checked the hitch. Everything is looking great. You took the truck over to the dealership and had the oil changed, got a lube job, checked all the tires including the spare and had them check all the fluids. No problems. You’re good to go. You’ve sorted through your tackle box and replaced anything missing. You’ve inspected and cleaned your rods and reels, replaced the old line with new and put them back in their cases ready for the big day. You’ve gone to the grocery store and stocked up on your share of the groceries plus a couple of cases of beer which you now have icing down in a cooler. But wait! What’s wrong with this picture? Actually there is nothing wrong…Yet. You have done everything you can to make sure this weekend is perfect. As for the beer, there is nothing wrong with that either. It is how and when you consume these beers that could spell the difference between a fun weekend and a disastrous weekend. There is nothing wrong with a few beers in the evening, sitting around a campfire or relaxing in the hot tub aboard your house boat. The problem arises when you have a few beers and drive your boat. I know! You’ve done it a hundred times and nothing ever happened. Besides, what’s a few beers? Beer isn’t all that intoxicating. 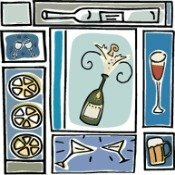 alcohol as 5 ounces of 12% wine or 1-1/2 oz. of 80 proof liquor. Driving a car while intoxicated is dangerous, but not as dangerous as mixing alcohol and boating. This is, in part, due to various stress factors inherent to boating: motor and engine noise, sun, glare, vibration, wave action, temperature, and wind all of which together can exacerbate the effects of drinking. In an interesting study on alcohol and boating conducted by the BoatUS Foundation in January 1999, four participants, two men and two women, were asked to drink 1 oz. of either 80 proof rum or 80 proof vodka. They had the option of taking it straight or mixed with water. After waiting 15 minutes for the alcohol to enter their bloodstream, they were asked to submit to a breath analyzer to establish blood alcohol concentration (BAC), and three Field Sobriety Tests. These tests consisted of walking a straight line for nine paces and walking back, standing on one foot while counting to 30 and the Horizontal Gaze Nystagmus test. In this test the subject is asked to focus on the movement of a pen or some other subject held just above eye level. 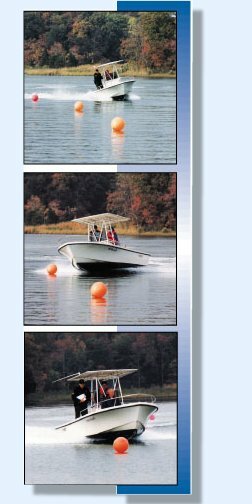 •	a slalom course at planing speed through six buoys. •	a steerage-speed run through six more buoys placed in a zigzag pattern. •	and a docking test. •	Three failed the eye test. •	All four performed adequately on the water test. •	Two hit the dock. •	All four did poorly on the field sobriety tests. •	Two hit the dock and one hit a buoy. •	All four varied boat speed greatly, made very wide turns and overcompensated on the helm. •	Again, two hit the dock and one hit a buoy. •	One man and one woman had to be removed from the testing. •	The two remaining participants got through the water course but with great difficulty and were clearly a danger to themselves, passengers and other boaters. I should make note that this test on alcohol and boating was conducted under very strict conditions to insure the safety of the participants, observers and other boaters in the area. 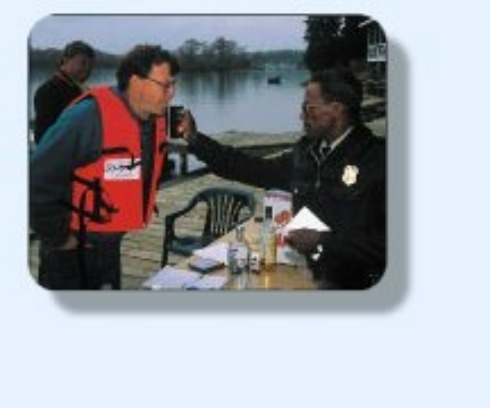 Report #32: January 1999 - Alcohol and Boating: Drinking on Your Boat - It Really Does Matter. 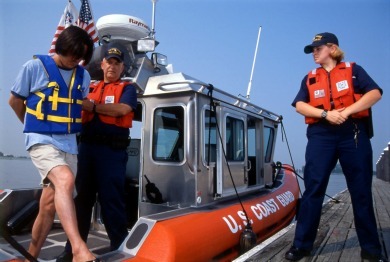 alcohol is a major factor in as much as 50% of all recreational boating fatalities. A boat operator with a BAC above .10% is 10 times more likely to be killed in a boating accident than a boater with zero BAC. Drinking coffee or taking a cold shower will not sober you up; only time can do this. For every drink you consume, it takes approximately two hours to sober up. 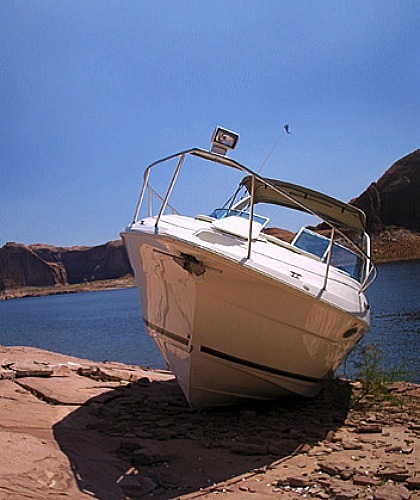 So what does Arizona and Utah law have to say about alcohol and boating? “Utah law prohibits a person under the influence of alcohol and/or drugs to operate a motorboat. Conviction of boating under the influence may result in: the loss of your motor vehicle driver’s license, a fine up to $5,000, a mandatory jail sentence, community service work, and rehabilitation assessment. 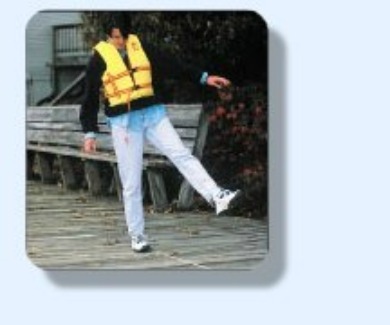 A person under age 21 may not operate a motorboat with any measurable amount of alcohol in their body. In addition, a person may not authorize or knowingly permit a vessel owned by him, or under his control, to be operated by a person who is under the influence of alcohol and/or drugs…. 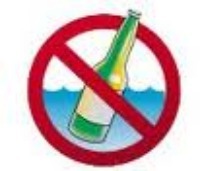 The operator of a motorboat may not have an open container of an alcoholic beverage while the boat is in operation. 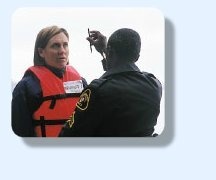 A person operating a boat on Utah waters is considered to have given consent to take any chemical test by a peace officer who feels the person has been operating a boat while under the influence of alcohol and/or drugs. That is a pretty scary law!! Can you imagine losing your motor vehicle license, your car, your boat and probably your job if you had to spend a year in jail as a result of mixing alcohol and boating? I think all of those reasons are enough to make me limit my drinking to after boating hours. I hope you feel the same.